Many communities have researched the application of novel network architectures, such as content-centric networking (CCN) and software-defined networking (SDN), to build the future Internet. Another emerging technology which is big data analysis has also won lots of attentions from academia to industry. Many splendid researches have been done on CCN, SDN, and big data, which all have addressed separately in the traditional literature. 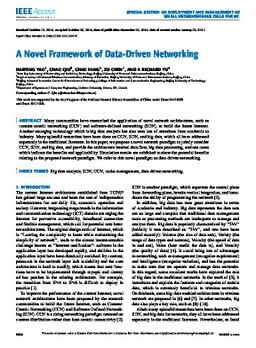 In this paper, we propose a novel network paradigm to jointly consider CCN, SDN, and big data, and provide the architecture internal data flow, big data processing, and use cases which indicate the benefits and applicability. Simulation results are exhibited to show the potential benefits relating to the proposed network paradigm. We refer to this novel paradigm as data-driven networking.